Seriously, you can’t go a year without someone calling out fast fashion retailer Zara for some kind of infringement through the form of the reproduction of products and designs of anyone, from big name high fashion labels to lesser known indie designers. Well, it is that time of the year again, and for the past two days, Zara has been on the receiving end of a media frenzy for basically ripping off a lesser known designer. To make things worse, they then told her that they will get away with it ‘because they can’ if you’re not famous enough – something which they initially told the lawyers of this year’s victim. Let’s take a look into this person on a mission to get herself justice, as well as the other brands that Zara have taken ‘inspiration’ from. We start with the latest victim. 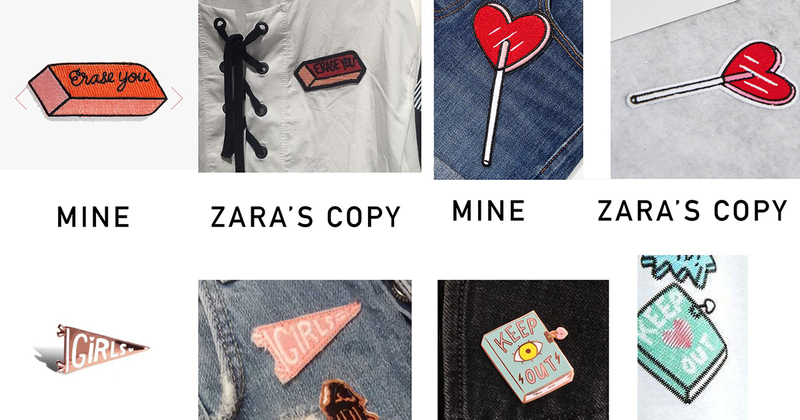 Earlier this week, Los Angeles-based designer Tuesday Bassen finally let loose on social media that her pin designs had allegedly been copied wholesale by Zara. As a matter of fact, she told Huffington Post, her fans even thought that she was working with Zara. At the same time, she also began receiving messages from people notifying her of what they’ve seen in stores about Zara plagiarising her work. This has been happening since early 2016. Wow, thank you @adamjk for making this round up of @zara's plagiarism of my work. I have now switched to an aggressive lawyer who is on the case and I am actively pursuing it. I want Zara to know that it is not okay to EVER steal the work of an artist, whether it be mine or any number of the other creators affected. Finally breaking their silence, Zara’s parent company, Inditex, told Buzzfeed News that they have since suspended sales of all the items in question. Investigations are also underway, and they are currently in direct contact with Tuesday Bassen’s lawyers to resolve the situation. I think Zara’s lawyers will be quite busy, because as it turns out, Tuesday Bassen was not the only designer and artist that Zara has ripped off for their summer collection. Guess their strategy of copying from indie designers and artists backfired big time, so they should probably just go back to copying the bigger brands. In other Zara ‘inspiration’ news to come out of 2016, earlier this year in May, Zara unveiled their Streetwise collection. 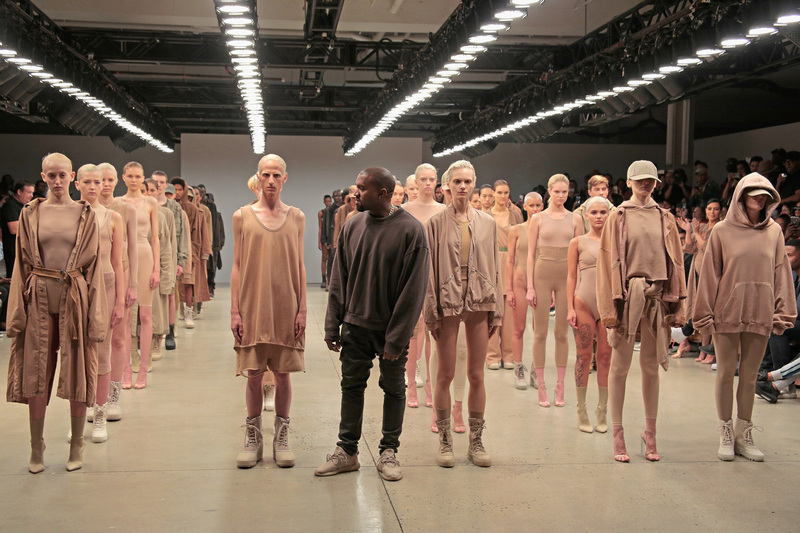 Just one problem though, people started seeing an uncanny resemblance to the Yeezy label by a certain Mr Kanye West. Love him or hate him, Kanye West has built a respectable following for his Yeezy brand ever since splintering off from its roots in footwear with Adidas, with his own ready-to-wear clothing line that promises to be ‘affordable’. 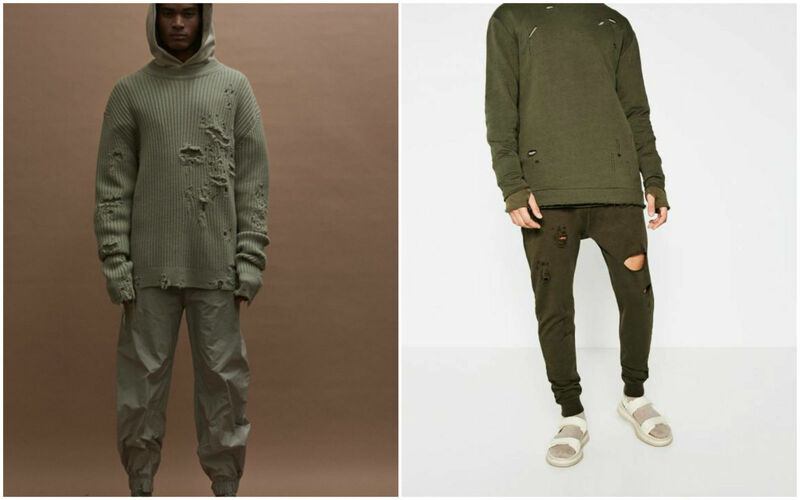 Zara traditionally copies from already released designs, but due to Yeezy deciding not to release the new collection according to the traditional fashion calendar, Zara was actually the first to release an imitation. Even sportswear brands are not safe from the preying eyes of Zara! 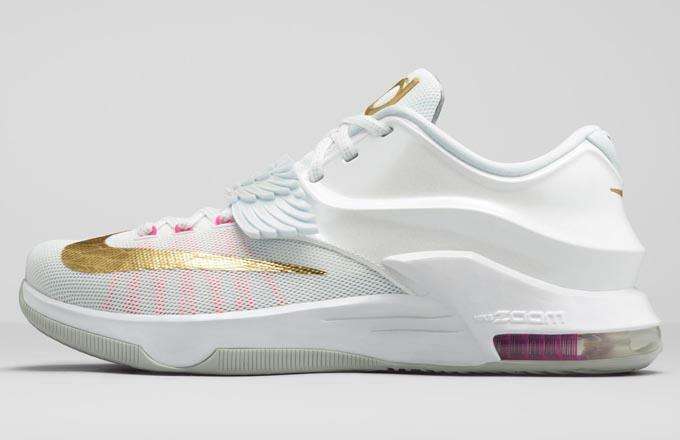 As the guys at Complex found out, Zara more or less released a tribute band of their own with this shoe last year. Called the ‘Sneakers with Curve Detail’, it is basically a greatest hits collection of ever popular line of shoes that Nike has released so far. In one swoop, Zara has distilled every single trendy Nike sneaker and combined them to create a Frankenstein of a shoe. Well, at least it was cheaper than having to buy all those Nike shoes at the same time, with the Zike setting buyers off a reasonable (enough) US$70. Still in the realm of footwear, but this time, something a lot more up-market. In a case where the original designer lost in his fight against Zara, here is Christian Louboutin and his array of beautiful ladies footwear, each sporting his signature lacquered red sole colouration, which he trademarked in 2008. 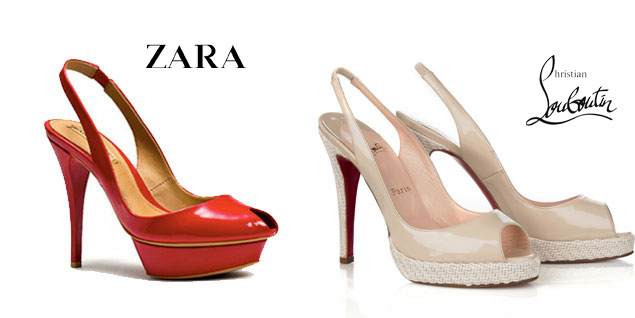 In 2012, the French luxury fashion designer lost his lawsuit against Zara, with the court ruling that customers will not be confused between his premium priced shoes and the lower quality, far cheaper ones sold by Zara. Apparently, these Zouboutins not only featured a red sole, but had even allegedly copied Louboutin’s Yo Yo sling backs. A year earlier, he pressed on with a lawsuit against Yves Saint Laurent for their use of red soles on their ladies footwear. The founders of London-based fashion label, Sibling, decided to take it upon themselves to air their displeasure against Zara. The piece in question involved a rose floral pattern overlaid with black dots design that they have worked closely on to produce with an Illinois-based artist, Chad Wy. The design first appeared in Sibling’s Autumn/Winter 2013 Sister by Sibling collection. Zara had used the design for both a sweatshirt and skirt, and it was already in circulation by late 2013, but Sibling only found out in the middle of 2014. Unfortunately they decided not to pursue the matter, with the only comfort being the messages of support from their fans. 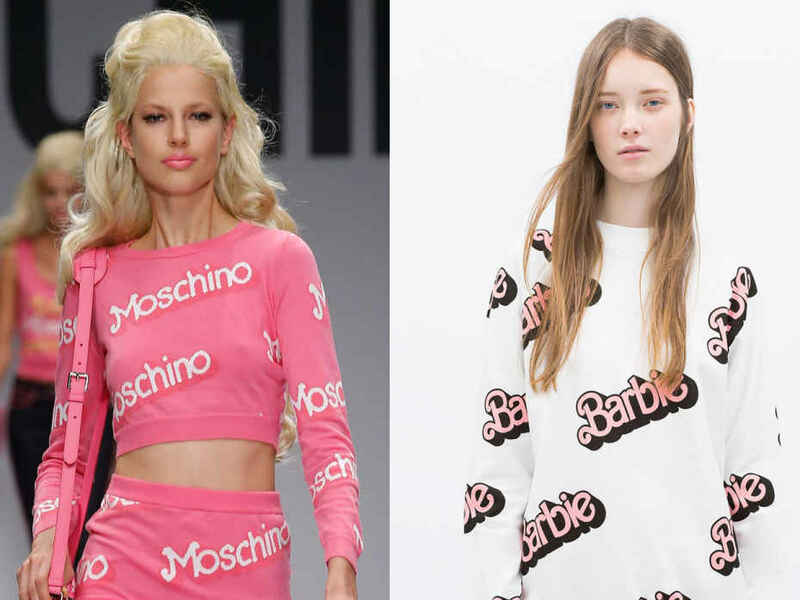 This happened around the same time as when Jeremy Scott revealed his second Barbie-inspired collection on the runway under the Moschino brand. Zara, in typical fashion, wants to be a part of the conversation with every girl’s favourite plastic doll, and decided to let loose their own. Bearing all the hallmark resemblance of a true Zara, they made a monogram-print line of ladies wear which looks to be a combination of both seasons of Moschino’s Barbie line – right down to the font of the word, the drop shadow, and the angle. The only difference is that Zara has them printed on loose sweatshirts. This was just a brief list of designs that Zara has purportedly copied, with more instantly being available to you with a few keywords on Google. Is a quote that I have seen on many occasions, and hey, even Steve Jobs said it, but I think where the problem lies with Zara is that they are doing it so blatantly on a yearly basis that it is to the point where people are not surprised anymore, and those susceptible to being copied are just quietly waiting with their lawyers.